katapi Bible Atlas: GM API v3 Map. The Corinth of St. Paul was a new city. The old Corinth had been destroyed by the Romans in 146 BC, but exactly a hundred years afterwards it was refounded by Julius Caesar as a colonia, under the name Laus Julia Corinthus. A number of Roman names in the NT are found in connexion with Corinth: Crispus, Titius Justus (Ac.18.7f), Lucius, Tertius, Gaius, Quartus (Ro.16.21-23), Fortunatus (1Co.16.17). The population would consist of (1) descendants of the Roman colonists of 46 BC, the local aristocracy; (2) resident Romans, government officials, and business men; (3) a large Greek population; (4) other resident strangers, of whom Jews would form a large number (their synagogue Ac.18.4). Of these some joined Paul (Ac.18.4-8, Ro.16.21, 1Co.9.20), and the consequent hatred against him led to a plot against his life. The church, however, consisted chiefly of non-Jews (see 1Co.12.2). Paul did not at first intend to make Corinth a centre of work (Ac.18.1), but a special revelation altered his plans (Ac.18.9f), and he remained there at least eighteen months. The opposition he met in the Jewish synagogue made him turn to the Gentiles. Paul left the baptism of his converts almost entirely to his subordinates, and himself baptized only Stephanas (1Co.16.15), Gaius (Ro.16.23), and Crispus, the ruler of the synagogue (1Co.l.14-16). 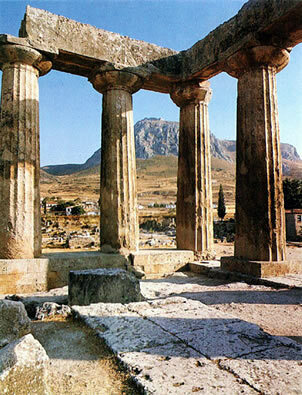 Some weeks after his arrival in Corinth, Paul was joined by Silas and Timothy, returning from Macedonia. News brought by Timothy caused him to write there the First Epistle to the Thessalonians (1Th.3.6), and the Second was probably written there also, soon after the receipt of an answer to the First. While Paul was in Corinth, Gallio (q.v.) came there as proconsul of the second grade to govern Achaia, probably in the summer of the year AD 52. The Jews brought an action before him against Paul, but Gallic, rightly recognizing that his court could take no cognizance of a charge of the sort they brought, dismissed the action. Paul's preaching was thus declared to be in no way an offence against Roman law, and in future he may have relied more on his relation to the State, as he faced the growing enmity of the Jews. After the examination, Gallic permitted the populace to show their hatred to the Jews (Ac.18.17). It was in Corinth that Paul became acquainted with Prisca and Aquila (Ac.18.2, 3, 18, 26), and he lived in their house during all his stay. They worked at the same industry as himself, as leather workers or 'tent-makers,' and no doubt influenced his plans for later work. They also left for Ephesus with him.